I hate beer and wine. Despite recent pictures posted to Facebook from our Spain trip, I am not a big drinker. I don’t enjoy it, but I do enjoy watching people get all silly when they’ve been drinking. This is how I ended up as the designated driver all through college. But I digress. Back to my shocking secret. I hope I didn’t run anyone off with my confession! So if I’m not a fan, then why on earth am I sharing a recipe that uses beer? Because I love a challenge! I recently became a member of Stonyfield Farm’s Clean Plate Club and one of the things I like about it are the monthly challenges we get to participate in. For October, one of the challenges was to combine beer from Peak Organic Brewing Company and Stonyfield Farms yogurt in a recipe. I was definitely intrigued and immediately had an idea, but my fall tax deadline at work and vacation last week got in the way of me playing around until just now. My first attempt was a savory version, but not knowing my different types of beer, I inadvertently used a bitter one and it just overwhelmed the results for me, so it was back to the drawing board for me. I’ll work on the savory one again and hope it turns out better next time. 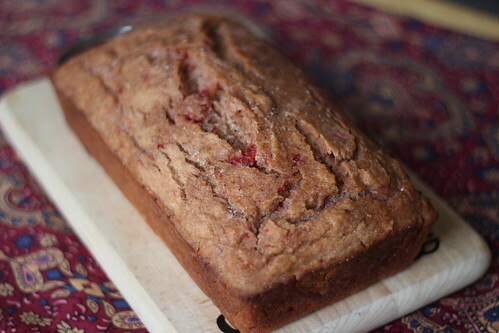 Since my savory beer bread was a flop, I decided on a sweet version this time around. Beer bread itself is a pretty basic recipe and you’re really only limited by your imagination (or lack of beer knowledge, ahem!). So I decided to see what happened if I added some yogurt and pie filling to the mix. I knew my version would probably end up moister than most because of my additions, but that’s okay! And you know what? It turned out fine! I was concerned that I’d be able to taste the beer in the bread like I had with the first attempt, but I think all the brown sugar, yogurt, and pie filling drowned it out. If you would like to make a non-alcoholic version, I’m pretty sure you can substitute soda for the beer. 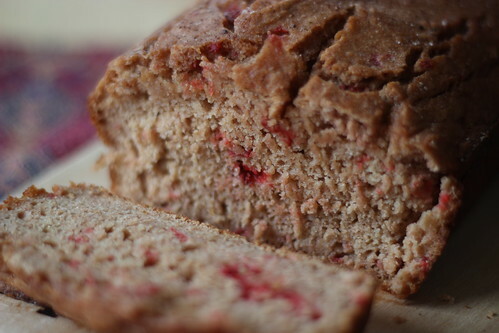 What drew me to playing around with beer bread was the fact that it’s one of those dump and pour into pan kind of recipes and the fact that it’s so versatile and you can make what you want of it. Feel free to play around with the flavors for the pie filling, yogurt, and beer. 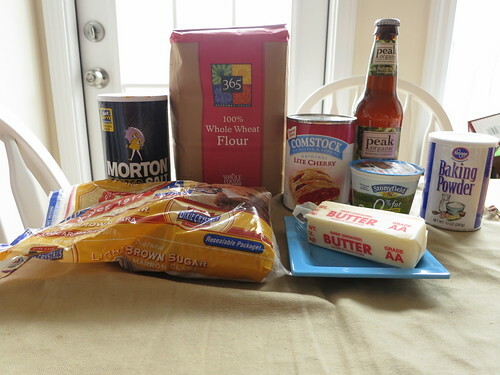 For the basic beer bread recipe, omit the pie filling and yogurt, and substitute 3 tbsp. of white sugar for the brown sugar. Disclosure: As part of this month’s recipe challenge, Stonyfield Farms provided me with coupons for the yogurt and a giftcard for the beer from Peak Organic Brewing Company. 1. Preheat oven to 375 degrees Fahrenheit. Spray a loaf pan with cooking spray and set aside. 3. 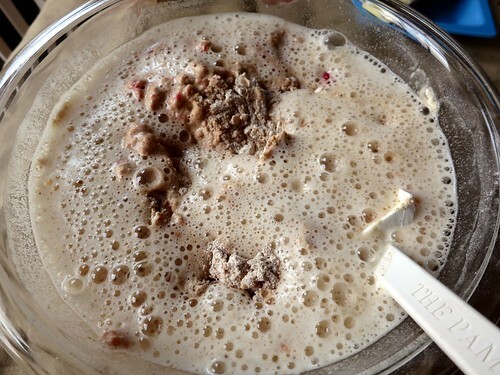 Add the yogurt and cherry pie filling, then carefully combine with dry ingredients. You don’t need to mix it all thoroughly yet. 4. Slowly add beer, and now mix everything together. The batter should remain lumpy. 5. 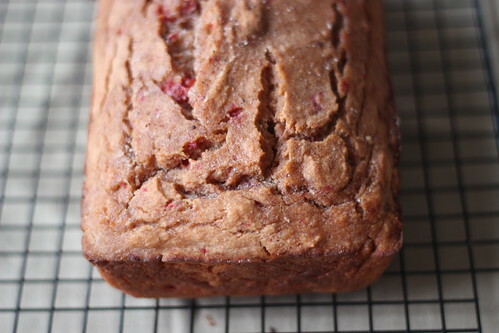 Pour batter into prepared loaf pan and bake for 45 minutes. Leave oven on, but remove pan. Pour the melted butter over the top of the loaf and then sprinkle with sugar. Place back into oven and bake an additional 15 minutes, or until you insert a toothpick into the center and it comes out dry. 6. Cool pan on wire rack and then remove from pan to continue cooling. This actually looks and sounds good. My husband is the beer drinker, and I’m the occasional wine drinker. I can use one of his beer. 😛 I will try this out. Thanks, Sues! I’m going to have to get some inspiration from you!